OK Go were YouTube's music-video darlings: their inspired 2006 video for "Here It Goes Again," featuring a choreographed treadmill dance routine, was watched by more than 50 million people. But fans were outraged when videos for the band's latest album, Of the Blue Colour of the Sky, were viewable on YouTube  but not sharable. 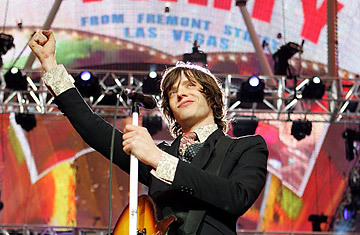 Lead singer Damian Kulash posted a lengthy letter to fans on the band's website, explaining the difficulty. It's a symptom of a struggling music industry, Kulash wrote: like many record companies, the band's label, Capitol, feels obliged to keep tight rein on its artists' music videos as one of their few remaining revenue streams. His letter soon went viral, as a clearheaded explanation of the problems the music industry faces. Kulash sat down with TIME to talk about OK Go's videos, the backlash and what the band is doing next. See Fergie, Bees & Puppets: Grammy's Best Videos. You've had more success than just about anyone with music videos online. What tipped you off that this was the way to go? As a rock band we try to make decisions that keep our career going, but that's a distant second to making things that we care about and that we have fun making. We always made these little things for our friends and our fans, and at the dawn of YouTube, some of them just caught on. And we had no idea of the sorts of numbers that were conceivable. Have you guys ever tried to sit down and tally how many views all your videos have gotten? No, not really. Our manager tried, but I'm not sure I believe him because he wants there to be a certain amount. But it's no question that its in the hundreds of millions somewhere. Did you see these views online translate into more people at the concerts, more people interested in picking up your album? It's hard to draw direct causal linkages between these things. But I will say that our record wasn't released in some countries around the world where we then showed up and had thousands of people come to concerts. Everything you've done has been really creative but low-budget. Do you think there's a spot anymore for the expensive, epic, "Thriller"-type music video? I don't think the issue is one of production values so much as it is of purpose. Videos really evolved in a harsh selective environment, with MTV being the only outlet for them for 25 or 30 years. What we know as the music video is a response to what could get played on MTV. If your video wasn't played on MTV, it might as well not exist because there was no other way for it to get shared with the universe. That selective pressure is almost totally gone now. There's an opening for music videos to be something other than straight marketing. The way our band views videos is they're really something we make the same way we make our songs. Your latest video, "This Too Shall Pass," had some backlash from fans because, unlike your first few videos, users weren't able to embed the clip on their blogs or on other websites. When did you get tipped off that this was going to be a problem? It was actually the video before  for the song "WTF." We put it online and started getting complaints from our fans. It wasn't on the front page of YouTube, there wasn't a huge splash about it. By the time the second video came out, it was a day or two before our inbox was flooded from fans all over the world. What's the response been from your label and fans since you put this letter out? At last check, all the people I work with regularly at the label seemed to think it was a very evenhanded telling of the story. The loudest online reaction tends to be from disagreers  there are a lot of people out there who think labels are Satan's spawn. It's not only a really simplistic view of the world, but it's one that misses major chunks of how the music industry works. Our fans themselves are expressing a lot of gratitude for being communicated to so directly about things like this. But this letter has gotten an enormous amount of public attention and I think there's a quiet majority who are just interested in seeing the music industry explained. We have five videos in the works, which is really so rewarding and so fun in a way that so often things in the music industry aren't. We spend a week or even a month with very interesting people who are experts in something. It's like playing in someone else's universe. We're working on one now with a group of nearly 20 engineers and designers and we're building a giant machine in a warehouse that we'll shoot in February.